Pictured above: A field of pockmarks—depressions in the seafloor—off the coast of Morro Bay, California, as seen in a map created with sonar data collected using MBARI's mapping autonomous underwater vehicle (AUV). A fleet of floating wind turbines anchored in deep water off the California coast could boost the state’s production of clean energy and help the state meet its ambitious climate change goals. But for that vision to become reality, the seafloor in the area of the proposed wind farm must be stable enough for the turbine anchors and the cables that will carry the energy to shore. With his long career of studying the seafloor—including the specific location of this proposed wind farm—MBARI Geologist Charlie Paull is the perfect person to lead the study of the site. Extensive areas in federal waters off the coast have an average wind field appropriate for power generation. To be viable, a site must be in close proximity to existing power distribution lines with unused capacity. The recent decommissioning of the Diablo Canyon Power Plant in Morro Bay, California, has opened up that capacity, leading to interest in placing a wind farm offshore for clean energy harvesting. Given the urgent threat of climate change, the development of clean energy alternatives is essential. This project helps provide the necessary science data for policy makers to determine if an area is safe for an offshore wind farm. Floating wind farms are more economical to build and maintain, as well as potentially significantly larger, than those on rigid platforms, but require relatively deep water (more than 500 meters, or 1,600 feet) for their emplacement. The steep seafloor slopes off Morro Bay reduce the distance submarine cables would need to extend and yet it is far enough offshore to minimize their visual impact. In October 2018, the federal Bureau of Ocean Energy Management (BOEM) began the public-comment process regarding the impact of wind farm development in particular potential leasing areas. Map showing location of potential offshore wind farm lease blocks, provided by the Bureau of Ocean Energy Management. Before the development of such facilities can proceed, policy makers will have to balance their benefits with their potential impacts. Deep-water wind farms inevitably would alter the local environment in ways that could be harmful to marine life, but they also represent a significant step toward ameliorating the Earth’s most dire environmental problem—emissions of greenhouse gases as a result of burning fossil fuels—by providing a new zero-emission energy source. Policy makers need basic scientific documentation of the existing conditions and processes affecting the area before an informed decision to proceed with such a development can be made. Among the issues to be considered are the characteristics of the seafloor where the turbines would be anchored as well as the path the power cable(s) would take to shore. Up to early 2017, when this issue emerged, most of the seafloor slope offshore Central California had not been systematically mapped with modern bathymetric survey equipment. Nevertheless, the old surveys showed several geologic features in this area that might impact the stability of seafloor anchors and submarine power cables. Such features, commonly identified as geohazards, include channels and gullies that run downslope. In addition, the area off Morro Bay hosts more than 1,500 seafloor depressions, called pockmarks. Pockmarks are commonly considered to be geohazards and thus usually avoided by the oil industry, for example, when installing seafloor infrastructure. 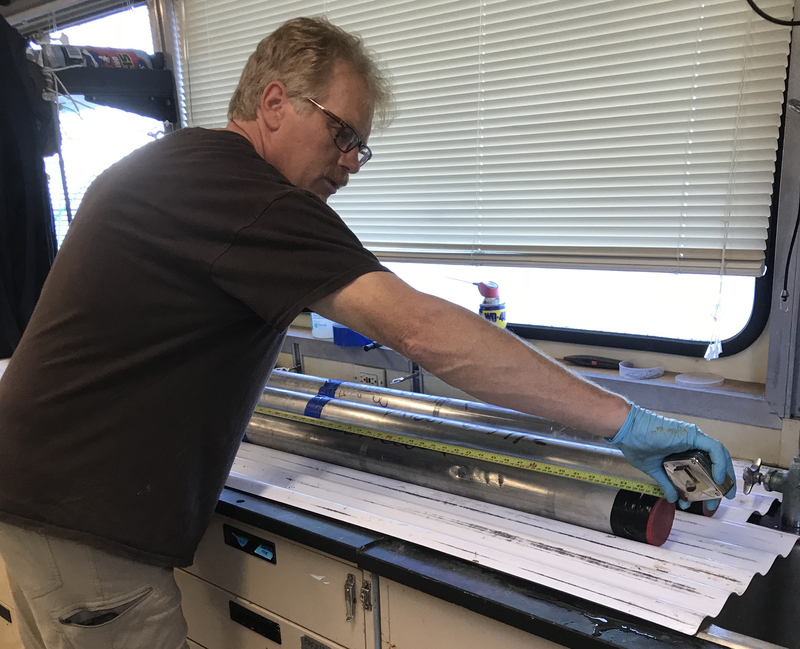 Paull’s lab had conducted the only two studies to date that had evaluated the processes that form seafloor channels, gullies, and depressions in this area. Scientist Charlie Paull explains studying the stability of the seafloor for installation of an offshore wind farm. This area also hosts one of the major corridors for submarine cables that connect North America with Asia. Although these cables are of strategic importance, there is little publicly available information about the long-term environmental impact of the existing submarine cables on seafloor habitats. 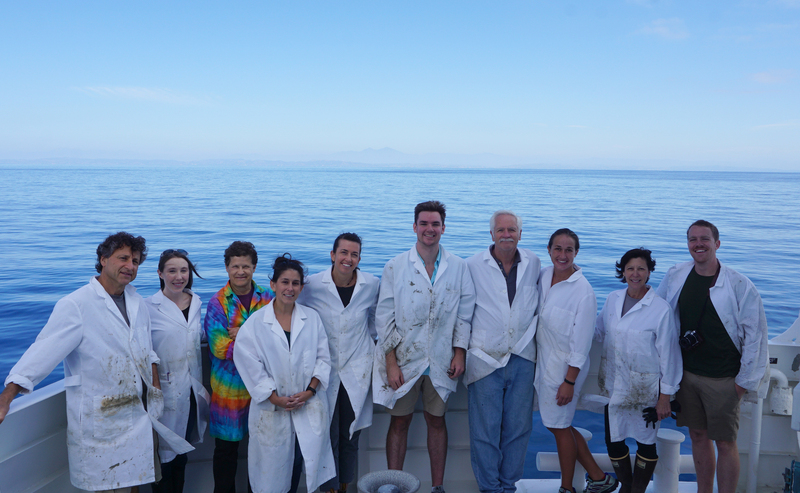 Much of the information that does exist was the result of earlier MBARI research programs. The robotic tools MBARI has developed, including autonomous and remotely operated vehicles (AUVs and ROVs), are well-suited for documenting the present environmental conditions and providing high-resolution information about dynamic processes that might threaten the wind farm installation. 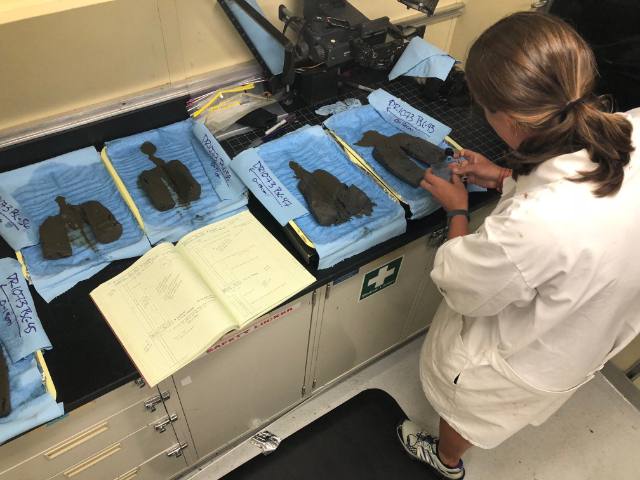 Data gathered with these tools will help assure that the design is engineered appropriately to account for the character of the seafloor in this area. However, for MBARI to plan and conduct field programs using these state-of-the-art tools, a regional bathymetric grid created with modern ship-based multibeam technology was necessary. At the beginning of 2017, bathymetric maps of this area were arguably of the lowest quality compared to all maps offshore of the lower 48 states, and inadequate even for the purpose of planning deep-water studies. Through a collaboration involving the California government, BOEM, the US Geological Survey, and the National Ocean and Atmospheric Administration (NOAA), one day of multibeam data collection off Morro Bay was arranged in 2017 aboard the NOAA hydrographic ship Rainier. The mapping provided a jump-start for MBARI to commence detailed process studies of the active geologic features and environmental conditions within the potential wind farm region. The newly collected multibeam data served as the basis for planning eight follow-up, high-resolution AUV mapping surveys conducted in April 2018 from MBARI’s R/V Rachel Carson. These surveys focused on the channels, gullies, and pockmarks. The scientific goal of these surveys was to establish how rapidly these features form, and to attempt to identify the seafloor footprint of existing buried submarine cables. A 14-centimeter-deep (5.5 inches deep) cable ditch seen in AUV bathymetry of the study site off Morro Bay. This was the first time MBARI’s mapping AUVs have been used to survey relatively flat seafloor since significant improvements in the AUV mapping resolution had been made in 2013. The improvements made a big difference, especially when it came to the telecommunication cable surveys. The above map shows the path of the submarine cables buried within the sediments as approximately 15-centimeter-deep grooves. Curiously, numerous smaller grooves crisscrossing the seafloor were also imaged. These grooves consistently occur as two parallel, shallow, linear depressions 100 meters (328 feet) apart, which matches the spacing of the otter boards used by fishing trawlers. 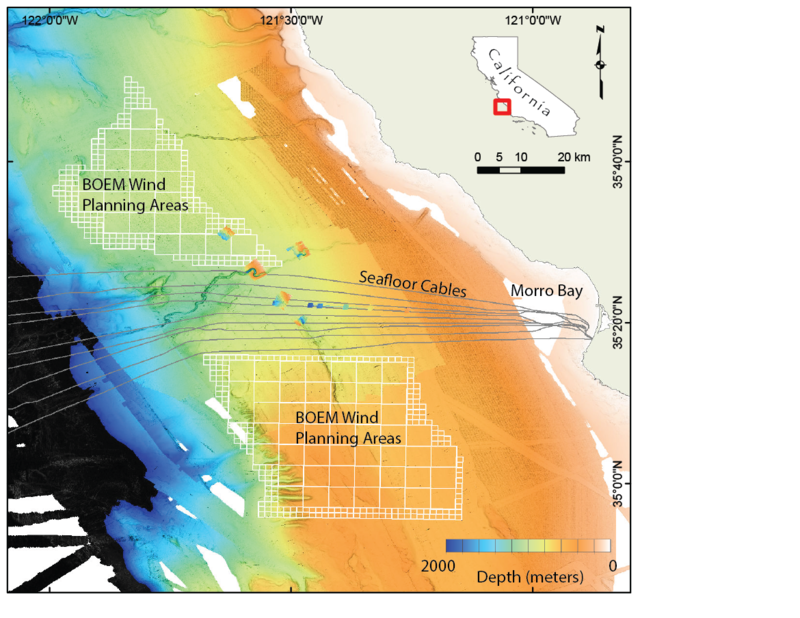 In the summer of 2018, USGS, BOEM, and NOAA continued systematically mapping the potential wind farm sites off Central California. Previous studies have shown that there are more than 1,500 pockmarks in the vicinity of the potential Morro Bay wind farm sites. The AUV data show the pockmarks are nearly perfectly round, smooth-sided depressions up to 10 meters (32 feet) deep and 100 meters (328 feet) in diameter. The processes leading to pockmark formation are poorly understood. Some researchers think pockmarks are fluid-venting features. However, work conducted by Paull and his group in the past found no evidence for fluid venting from these depressions. This image shows 25 of the pockmarks with a two-meter (6.5 feet) contour interval. Color scale ranges between 925 meters (3,034 feet) and 965 meters (3,166 feet) water depths. The new AUV surveys also mapped bends in the submarine channels and gullies that cut across the slope. 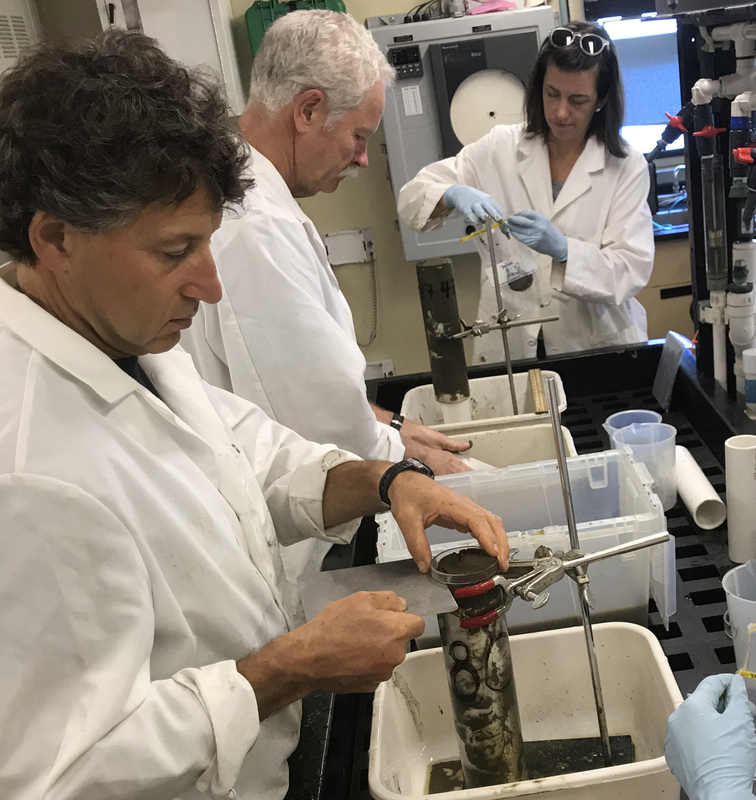 Using this information as a roadmap, targeted sampling—involving collecting long cores of seafloor sediment—with the ROV will be conducted in 2019 to establish the rates of these seafloor-modifying processes. This is a critical step in evaluating the potential hazards these features represent to the installation of seabed infrastructure. MBARI will also conduct additional AUV mapping surveys in 2019 to further refine the detailed maps. The coordinated effort among government agencies and MBARI will lead to a better understanding of the evolution of the seafloor in this area, including the origin of the enigmatic pockmarks, the activity of the channels, and the long-term impact of the cables on the seafloor habitat. MBARI is proud to be able to contribute its marine operations and science expertise to this effort to address societal needs, and is able to do so through its steady commitment to technology development and improved understanding of basic ocean processes. From left, Roberto Gwiazda, Charlie Paull, and Eve Lundsten process sediment cores. Photo by Nora Nieminski.